S.A.L.T. is our monthly ladies’ meeting held in Church from 8pm to 9:30pm on the third Monday of the month (except January and August). We have times of prayer, fellowship, encouragement and fun with lots of coffee and cake! Our aim is to share God's love in the community through prayer and action. 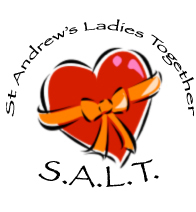 We want to be the salt-seasoning that brings out the God-flavours in the world around us by showing God's love to our neighbours and blessing the community through our actions and acts of kindness. Our meetings can be very different, from invited guests telling us about their work and experiences, to our Afternoon Tea Party with a Difference (it’s in the evening!) and our Macmillan coffee and cake fund raiser. So ladies, we would welcome you all to join us at S.A.L.T. Hello ladies - keep an eye on this page to see what event we have planned next.